How to apply image as background to a window in Windows XP ? Earlier in Windows 2000 , we used to do this . Right click in the window , and change the background image of the window .One of my readers asked me whether he can do the same in Windows XP ? The answer is yes.You can have something like as shown in the figure. There is a software called Windowpaper XP which lets you set the wallpaper in the back of any window - just like your desktop.The usage is also quite simple. 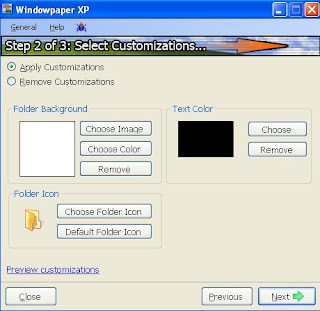 All you have to do is Select a folder and have to set different options shown in the figure.The options which will be available for you are - Changing folder Background Image , changing folder Background Color , Setting the folder icon and the text Color. Once you select that Just click next and you are done. Looks good i try it.